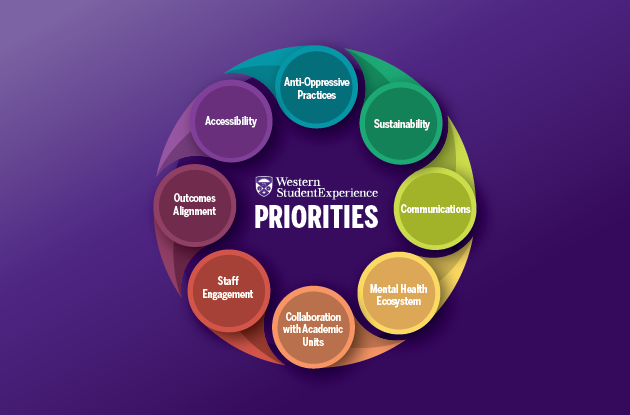 The Western Student Experience inspires all learners to ignite extraordinary change in the world. Support the whole learner's growth through programs, services and experiences that foster well-being, build connections and develop skills. • Develop leadership skills through experiences, mentoring, and formal training. • Acquire and apply a range of social, emotional, academic and workplace-relevant transferrable skills. • Engage in experiential learning opportunities through co-curricular engagement, work integrated learning, entrepreneurship and community engaged learning that prepare them for future professional, academic and work endeavors. • Access a more inclusive campus community that promotes cultural awareness and competencies among students, Indigenizes the institution, and removes barriers to student learning. • Achieve well-being through active participation in a range of programs and services that promote healthy behaviours and support students in responding to challenges they experience. • Are community engaged by actively building connections with members of Western, local and global communities. • Identify and feel connected to the Western Mustangs community; students recognize that individual contributions to and membership within the Mustangs community contributes to both our individual and collective success. • Western’s campus community is more aware of and able to work with Indigenous Peoples and Cultures. • Indigenous Students are connected to the campus community. • Indigenous Students see themselves reflected in the campus community. • Indigenous Students have increased connection with their personal and cultural identity. • Western University has close ties with surrounding indigenous communities. • Indigenous students are supported through culturally responsive services. • Indigenous Students develop leadership skills. • Students, youth, faculty and staff are exposed to entrepreneurship. • Students develop transferrable skills through hands-on experience. • Western University is a hub for increased job creation through student and youth start-ups. • Student entrepreneurs have access to more professional resources and services on campus. • Student and youth start-ups have an increased survival rate. • Western’s institutional climate supports and fosters entrepreneurship. Coming soon. Outcomes Currently Under Development. • Develop leadership skills by working effectively in teams, learning to support their peers, effectively managing conflicts, and building self-awareness by exploring their own strengths and talents. • Achieve physical and mental wellness through engagement in healthy physical activity, nutrition, and sleep behaviours. • Build and apply resiliency skills, including a positive outlook, ability to overcome challenges, coping skills, and learning about effective outlets to stress. • Build self-management and goal setting skills, including the ability to set and achieve academic, personal and fitness / performance related goals while managing competing demands. • Establish supportive community connections to peers, faculty, and staff including civic mindedness and desire to contribute to their respective communities in the future. • Students have the skills, resources, and tools they need to succeed personally and academically. • Western’s campus community supports student mental health. • Western is an accessible campus community that supports diverse student needs. • Students develop knowledge, leadership, and professional skills through volunteer and professional training. • Western University is more Indigenized as an institution. • Students develop, can identify and articulate a range of transferrable skills. • Community and industry partners are able to access Western talent to contribute in meaningful ways to their organizations. • Students have increased access to a range of outside-the-classroom opportunities. • Students increase their ability to engage in career exploration, planning, and decision-making. • Students enhance skills and experiences that equip them to be global leaders. • Have greater understanding of the connection between wellness and academic achievement. • Develop skills and employ strategies to enhance their wellness. • Know about supports on campus that foster Wellness and how to access them. • Understand factors that contribute to their wellness. • Have streamlined access to mental and physical health services on campus.